I bought this a good few months ago for two reasons: a) as an attempt to bump up my reading of classics and, less intelligently b) because the Vintage Classic editions all look nice on a shelf together. I finally picked it up last week and although it took me a while to plough through it, I don’t regret a single minute spent. The plot of the novel isn’t much explained on the blurb – it explains Hester’s situation, but not the emotional journey she faces throughout. In fact, it’s not even primarily about her. The point of view stays mostly with the father of the child, with a little about Pearl and less about her mother. I won’t mention who the father actually is, although he’s identified to the reader fairly early on. Regardless of his identity, the novel narrates his struggle with the burden of his sin – he has not been punished as Hester has and so feels the weight more heavily. I had steeled myself for a novel-length lecture on weakness and untrustworthiness of women, while men are strong but are tempted to sin by those evil women. In fact, I found it fairly pro-women. A lot of reviews have slated it as anti-feminist but I really, really don’t see it. Obviously Hester is spurned by her village (it’s set in the 1640s, after all) for her adultery, but she is ordered several times to name the father so he can be adequately punished also. It’s mentioned several times they’re both condemned, not just her. The narrative seems to pity her somewhat – she always holds herself with dignity and fervently tries to repent for her sin. The reader’s attention is often drawn to this in an attempt to make us feel for her what her village cannot. My copy of The Scarlet Letter has a huge red ‘A’ stamped on the front, but it would be impossible to forget it regardless. 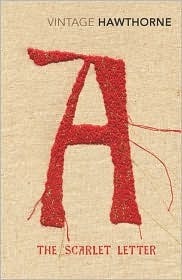 Mr. Hawthorne calls attention to it frequently so Hester is somehow embodied by that one red patch of colour. It almost has a life of its own – it’s what the townsfolk see when they look at her and Pearl can’t quite get past the symbol embroidered on her mother’s chest. It’s a very moving piece of imagery. It’s not really light reading. It’s taken me a good few days to struggle through, to be honest. The story is wonderful, but the prose and dialogue can be a bit… stodgy. Although it was written in 1850, it’s set two hundred years earlier and the syntax reflects that. It’s rather preachy and moralistic, but that’s only to be expected. I’d only recommend picking it up if you’re willing to exert a lot of time and effort into it. It’s definitely worth it, but it’s a slog. I really liked the ending, although it’s not what I would have expected. It’s not happy nor sad, but it is a fitting conclusion. It was especially clever how the townsfolk each adapted the spectacle to suit their own beliefs and wishes. That’s what the book was about, for me – about the emotion and judgement of regular people, and how sin can more easily be borne when it’s not kept to yourself. This is one classic I really do want to read, and you make it sound very interesting. I'm not sure whether your review makes me excited to get stuck in or worried about stodgy prose (a description I love by the way! )…I think excited for the time being! My main concern actually was the same as yours(! ); I was desperately hoping that it wouldn't be a diatribe against women. Yey for not having to worry about that anymore! I also had no idea that it was even partially told from the perspective of her daughter – clever idea. Makes me excited to read it again…I'm so fickle this evening! @LAB – No, it's really not a diatribe against women AT ALL. I was pleasantly surprised. I mean, there's definitely a lot of lecturing about sin, but in an un-gender-specific way! It's not really told from her perspective… maybe I phrased that wrong. It's more about what SHE'S doing and how SHE'S acting than Pearl though, if that makes any sense. I had to read this one in college, and was actually surprised to have enjoyed most of it.